Talent agency: Johnny's Entertainment Inc.
Matsumoto Jun started his entertainment career when he joined Johnny's Entertainment in 1996. Unlike other Johnny's talents where they audition to be included in the agency, MatsuJun received a direct phone call from Johnny Kitagawa, the head of Johnny's Entertainment, after submitting his application. This makes him one of the three Jimusho Elites, as they call them, that didn't have to audition in order to be a part of the talent agency, the other two being Nakai Masahiro of SMAP and Higashiyama Noriyuki of Shounentai. By September 1999, Johnny's grouped him with four other artists namely Ohno Satoshi, Ninomiya Kazunari, Sakurai Sho and Aiba Masaki to form the band, 嵐 (Arashi). Through the years, they released several singles and albums, and did several concerts both in and out of Japan. And up until now, they remain one of the most popular Japanese bands. Being part of Johnnies, he also became an actor. 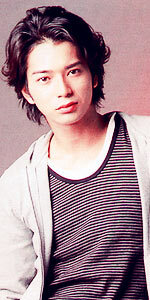 His first major role in a series was as Kindaichi in 2001's Kindaichi Shonen no Jikembo 3. But he was first widely recognized with his role as the high school delinquent Sawada Shin in 2002's Gokusen. Through the years, he has acted in several films and series and hosted a few shows, some of them with his fellow Arashi members.